1981: Lt Gen Lincoln D. Faurer, USAF, became Director of NSA. 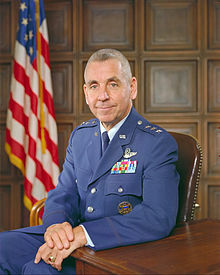 1 April 1981: Lt Gen Lincoln D. Faurer, USAF, (Ret) became Director of the National Security Agency. Gen Faurer served as Director of NSA and chief of the Central Security Service from 1981-1985. "Linc" was also a past Chairman of the BoD of the NCMF. Gen Faurer passed away on November 7, 2014 at the age of 86. A special funeral ceremony took place at Arlington National Cemetery in February 2015. "Linc" will always be missed by his friends at the Foundation. We are also very grateful for the donation from Gen Faurer's family of $10,000 to the Foundation. Gen Faurer's name is included on the In Memoriam Panel at the Museum and on our website. Learn more about Gen Faurer via the links below. You can make a contribution honoring Gen Faurer in our In Memoriam Registry (see link below) via our secure Online Donation Page or you can mail a donation in his name to the NCMF, PO Box 1682, Ft. George G. Meade, Md 20755. Those honored in the Memoriam Registry can be seen in the listing on our website (see link below) or viewed on the kiosk at the National Cryptologic Museum.